Many gynecologists see patients with uterine fibroids requiring treatment and automatically think surgery—either myomectomy to remove only the fibroids or a hysterectomy to remove the entire uterus. They don’t necessarily consider referring patients to an interventional radiologist (IR) who may be able to perform an effective yet minimally invasive uterine fibroid embolization (UFE) procedure. It’s a turf war, says Robert K. Zurawin, MD, an associate professor of gynecology and director of the fellowship in minimally invasive gynecologic surgery at Baylor College of Medicine in Houston. “Gynecologists and interventional radiologists each have cut out their turf and said, ‘Fibroids are mine,’” he explains. But Zurawin says it doesn’t have to be that way and it really shouldn’t. So he has developed a collaborative relationship with an interventional radiologist, John H. Fischer, II, MD, a partner in Singleton Associates, PA, a large subspecialized radiology practice in Houston, and a clinical assistant professor at Baylor College of Medicine. The two doctors and their respective partners have found that when gynecologists refer uterine fibroid patients to interventional radiologists and vice versa, everyone benefits—most importantly, the patients. Zurawin and Fischer have been referring patients to each other’s practices for a number of years and are so excited about the success of their collaboration that they are encouraging others to do the same. “We’ve spent a lot of time writing articles and lecturing around the country to try to educate both the gynecology and the radiology communities on the benefits of establishing a collaborative practice and how to set up fibroid centers that will take care of women effectively and do what’s best for the patient,” Zurawin says. The physicians’ most recent article on the effects of the gynecologist-interventional radiologist relationship on the selection of the treatment for patients with uterine fibroids can be found in the April issue of the Journal of Minimally Invasive Gynecology. The article was based on their study of 226 women seeking UFE for symptomatic fibroids. In it, they concluded that gynecologists’ “fear” of losing uterine fibroid patients to interventional radiologists is groundless and that both specialties get more patients when they each carefully select them. Approximately 25% to 50% of women have uterine fibroids, with the highest incidence reported in women aged 30 to 40. Fibroids typically begin as a single abnormal cell in the muscular layer of the uterus and slowly grow into tumorlike masses of connective tissue and smooth muscle. Most women experience no symptoms and their benign fibroids can be left untreated. Uterine fibroids rarely become malignant (less than 0.1%). However, in about 25% of women, uterine fibroids can cause symptoms that are uncomfortable and create difficulties for daily living, such as a heavy menstrual flow, increased cramping, pelvic pain, backaches, frequent urination, bloating, and infertility. The conventional treatment for fibroids has been hysterectomy. According to the National Institutes of Health, more than 200,000 women undergo hysterectomies each year as treatment for uterine fibroids. That number represents about one third of all hysterectomies performed annually in the United States. Another surgical option is myomectomy, which can be done through the navel using a laparoscope or vaginally using a hysteroscope, a thin telescopelike instrument that is inserted through the cervix and into the uterus. During the procedure, sometimes referred to as uterine artery embolization, a fluoroscope is used to guide the delivery of tiny embolic particles to the uterus and the fibroids. The small particles are injected through a catheter. The particles block the arteries that provide blood flow, causing the fibroids to shrink. The procedure does not require general anesthesia and necessitates only an overnight stay vs. two or three days in the hospital for traditional surgery. UFE has an impressive success rate: 85% to 90% of women who undergo UFE experience relief from their symptoms within a few months and are able to return to their normal routines within seven to 10 days vs. four to six weeks with surgery. Also, with UFE, recurrence of treated fibroids is rare. 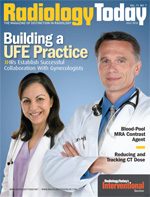 UFE is best for women who are premenopausal, don’t want to undergo surgery, and don’t plan to have any or more children, says Michael Hallisey, MD, FSIR, an interventional radiologist with Jefferson Radiology in Hartford, Conn. “As a general rule, we also want her fibroids to be less than 20 weeks size on her abdomen.” Other factors include the location and the number of fibroids and other medical conditions a woman may have, Fischer says. “There are multiple things we have to look at to decide what treatment option is best for any given patient,” he adds. If gynecologists don’t offer UFE as an option, many women learn about it on their own, thanks largely to the Internet and the experiences of friends and relatives, and may seek out interventional radiologists who perform the procedure. In Zurawin’s and Fischer’s study in the Journal of Minimally Invasive Gynecology, 138 patients were referred to the interventional radiologist by their gynecologist, but 88 were self-referred. “A significant number of my self-referred patients (about 11%) for UFE are upset because their gynecologist didn’t offer them all the options,” Fischer says. Some interventional radiology practices also market the procedure directly to patients and perform educational outreach to potential referring physicians. “It’s traditional for interventional radiologists to announce to referring physicians that ‘we have a new procedure [so] send us your patients,’” Hallisey says. “That’s the way it was always done for years.” But he notes that direct marketing has not always worked, especially with UFE. “If you just announce that you have a new procedure, the gynecologist is going to be suspicious,” he explains. Like Fischer and Zurawin, Hallisey has been collaborating with John Greene, MD, associate director of obstetrics and gynecology at Hartford Hospital. Hallisey says he often calls Greene and says, “‘This patient somehow got to me and I’m not quite sure that UFE is the right thing to do for her, so I’ve asked her to come see you.’” Likewise, because the gynecologists in the department know that Hallisey and his partners are selective about whom they treat with UFE, they willingly call them when they believe UFE is among the best options for a patient. Goodwin says at his practice, at least one half the patients whom the gynecologists refer for embolization don’t end up having the procedure. “I’ve sent a significant number of patients back and said, ‘I really think you should think about myomectomy or hysterectomy or watching and waiting or hormonal therapy,” he explains. Because interventional radiologists don’t perform procedures on every patient, they have built a rapport with gynecologists and routinely refer patients to one another to everyone’s benefit, Goodwin says. Fischer says once a patient is referred, his practice takes complete control of the case. “We see and evaluate every patient before the procedure. We do the clinical workup. We order the MRI. We do the patient’s preauthorization for insurance. We do everything from scheduling the procedure to following up a week or two weeks after the procedure. [We continue with the patient] further down the road at six to nine months and more remotely when necessary,” he explains. Whenever the interventional radiologist sees the patient, the doctor sends a letter to her referring physician to keep him or her in the loop concerning the treatment. “I don’t know how many times that gynecologists have called and said they really, really appreciate that,” Fischer says. Goodwin adds that “in my 14 years in this area, I have found that one of the most important things in terms of growing a practice is excellence of the full gamut of care.” Few patients who have undergone UFE develop problems afterward, but if one does and she goes to her gynecologist to solve the problem, the physician is going to remember the problem cases more than those that were successful, Goodwin says. “It’s just human nature to focus on what goes wrong rather than what goes right,” he notes. Another noninvasive procedure, focused ultrasound surgery, is showing promise as a treatment for uterine fibroids. “In my opinion, it’s not quite ready for prime time, but it is fairly promising,” says Fischer, who, with Zurawin, is one of the principal investigators for a new Philips MR-guided ultrasound unit. Fischer says it may provide another option interventional radiologists could offer women with uterine fibroids requiring treatment. Zurawin adds that presenting more than one treatment option can increase the value of collaboration between interventional radiologists and gynecologists. Another reason the collaboration could prove valuable: Some gynecologists want interventional radiologists to embolize fibroids prior to performing a hysterectomy. Zurawin, who specializes in minimally invasive procedures, says he sometimes has the interventional radiologist embolize the fibroid so that it will shrink to the point that he can perform a hysterectomy laparoscopically or robotically.